Stomach pain after eating yogurt is not normal and should be evaluated by your physician. The most common causes of stomach pain after eating yogurt is lactose intolerance, which causes cramping, and a milk allergy, which can cause inflammation in the digestive tract. Stomach pain from both of these conditions can range from mild to severe and should only last for an hour or two. If you have stomach pain from indigestion or another gastric condition, eating yogurt may help alleviate some of your symptoms, such as diarrhea. If you're lactose intolerant, eating yogurt can cause stomach pain. Yogurt is made from cow's milk, which contain lactose, a complex sugar that's unable to be absorbed by the body. Many people during adolescence become intolerant of lactose because their small intestines stop making as much lactase. Lactase is the enzyme used to break lactose down into simpler sugars, making it easy for the body to absorb. When you lack lactase, the lactose is not digested and causes stomach pain, gas, bloating, cramping and diarrhea. 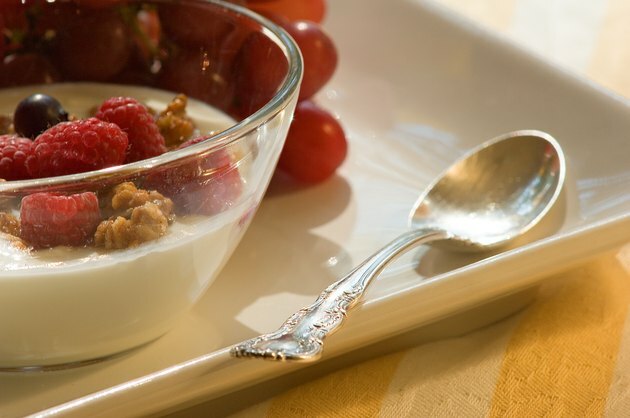 Stomach pain after eating yogurt may be related to a milk allergy. A milk allergy is more common in young children, but can affect adults as well. If you're allergic to milk, you will experience more than just stomach pain after eating yogurt. Because a milk allergy is an overreaction of the immune system, you will develop other symptoms, such as sinus congestion, runny nose, itchy skin, hives, facial swelling, tingling sensations, asthma, wheezing, shortness of breath and chest pain, according to KidsHealth. A milk allergy is a serious medical condition that needs to be diagnosed by your doctor. Yogurt is commonly used to treat stomach pain related to the stomach flu, food poisoning and other conditions that cause diarrhea. According to AskDrSears.com, eating yogurt can help restore good bacteria in the gut that can shorten the duration and severity of diarrhea. Yogurt contains probiotics that help maintain proper digestion. If you're lactose intolerant or have a milk allergy, you can also purchase probiotics from a pharmacy that are lactose and dairy-free. Whether you're exercising stomach pain from eating yogurt or you're using yogurt to treat stomach pain, your condition needs to be assessed by a doctor. Do not use yogurt, probiotic supplements or any other natural remedy without first talking with your physician. Is Yogurt Healthier Than Milk?